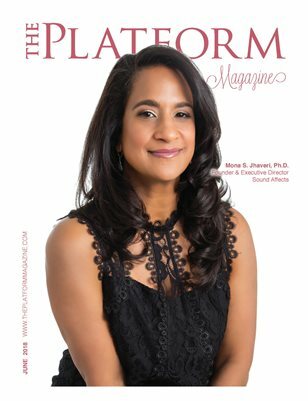 The Platform Magazine June 2018 Issue features CEO Mona Jhaveri of Sound Affects. The mission of Sound Affects is to dramatically improve cancer care and survival by empowering individuals to influence the future landscape of cancer-fighting treatments. The goal is to increase promising treatments in the pipeline by providing funds to bio-entrepreneurs translating research into groundbreaking cancer solutions.